Now I understand that chickpeas are NOT paleo-friendly; but I decided to cook this dish anyway because I wanted to serve some sort of heart-healthy protein to my guests. Last — but definitely not least — not all of you guys follow the paleo diet. Actually, I think that just a fraction of my readers are cavemen. Here’s the lowdown about this dish: rich, spicy, hearty, delicious. That’s it. So good. 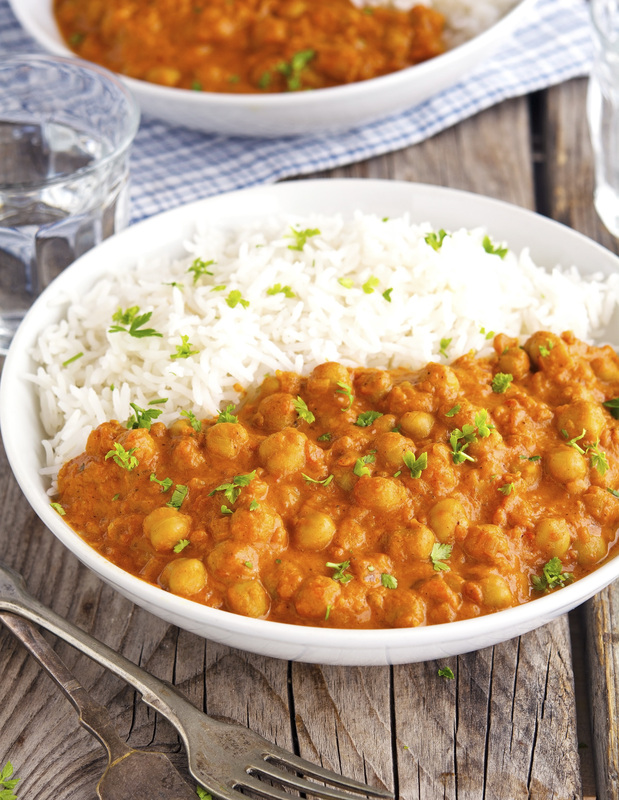 This (Vegan) Easy Chickpea Tikka Masala is awesome. Period. If you love my Chicken Tikka Masala, I’m sure you’ll love this one too. The gravy is delicious and works perfectly with the chickpeas. All of my guests forgot they were eating vegan as they polished this off. You might just do the same. (Vegan) Easy Chickpea Tikka Masala Print this recipe! One serving yields 393 calories, 13 grams of fat, 60 grams of carbs, and 15 grams of protein. I had to come by after I saw this on IG - and dude - WOW! I adore making masala with coconut milk - but haven't ever added cornstarch or arrowroot to it before - so gotta try that! I like to use it because it makes the gravy super thick and creamy. Do give it a try! Hi can I add ordinary milk instead of coconut milk??? It's not available nearby stores. I added tmato puree for more depth. Great recipe. I made this chickpea stew for lunch. Delicious recipe. I served over black rice. Trader Joe's has a great canned coconut cream that might make for a thicker sauce than the milk and arrowroot. There's coconut yogurt too, now. Yum! I love everything with chickpeas,I bet that your guests liked it very much! They did, actually they (almost) licked their plates! This looks amazing! Channa masala is such winter comfort food and yours looks seriously delish :) Pinning! I don't follow a paleo or vegan diet, so I eat all the things.. especially chickpeas in mass quantities. LOVING this tikka masala, Mike! Total flavor bomb of deliciousness going on here! I could eat this for dinner daily and be a very happy camper! Cheers, buddy! I'm sure you'd love this, it's truly delish! I might even add #WolfpackGreatness. Agree? I don't follow a paleo or vegan diet either, and I happened to be a huge fan of chickpeas. 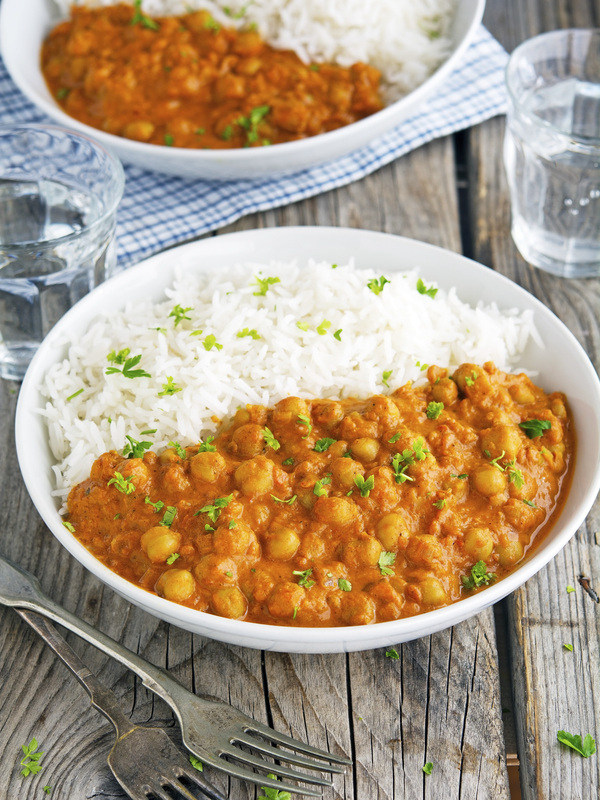 I've never combined chickpeas with coconut milk, and this sounds (and looks) amazing! This IS amazing my friend. You should totally give it a try! Hi Mike, this is one of my favorites, I can see why it was a big hit, looks delicious! I love the challenge of cooking for a Vegan as well, (since I don't follow any particular diet myself) but I don't think it will be a challenge next time because I'm definitely making this! That's awesome. When you do try it, please report back. I'd love to hear your thoughts about it! Yummers! This sounds and looks awesome definitely getting pinned! Well, hello stranger! I'm so glad to "see" you. Thank you so much for stopping by Tam! Lovely meal, such comfort food! Hello! I wonder if you could swamp Xanthum Gum for Cornstarch? ....I have a ton I'm trying to use up! Looks yummy! Do you know if it can be frozen? This is an Awesome recipe and a great way to enjoy a vegitarian meal without sacrificing flavor! Do you drain the tomatoes or leave the juice? 12 inches of ginger?! A foot of ginger? Is that right, or is it 1 2-inch? Thank goodness! I also read it as 12 inches of ginger, and I am not a big fan of ginger. Can you please suggest how much ground ginger to use as a substitute for the fresh ginger? Thanks. This is out of this world! I'm trying to eat better and your recipes are seriously helping! Made your pizza for the family a few nights back and they loved it. Did the Chicken Enchilada casserole kinda botched it. Pretty sure I burned the spices for the sauce. This however, is amazing! Served it with some brown basmati rice and the flavors were perfect. Repeating an earlier question, does this freeze well? Hi, I was wondering, is that carb count including the rice? Because otherwise this over cauliflower would be legit and hopefully lower the overall carb count, right? I made this for dinner tonight, and WOW! DELICIOUS! Thank you so much for the recipe. I used brown rice and it was fantastic. I also didn't use cornstarch or arrowroot as my sauce was already pretty thick. Well, yes. Coconuts aren't animals. My daughter said she wants to be a vegan so I was searching for easy vegan recipes. I notice the recipe calls for coconut milk. Coconut milk is ok to use in a vegan recipe? This dish was amazing!!! I omitted the paprika and cayenne (feeding 6&8 year olds) and the dish was still flavorful!!! It went perfectly with homemade naan and spiced rice. Thank you for sharing such a wonderful dish!!! I get the cayenne but i have been eating Paprika since very little. Lots of flavor and little to no heat. Try it, they'll like it. This recipe is almost unprecedented but it is also very healthy. Gotta give it two thumbs up! I am making this tonight.... but is that one 2" piece of ginger or a 1/2" piece? This was delicious! The flavors came together so nicely, it had a great consistency and was super filling!! My husband and I loved it, plus we will have leftovers for the rest of the week and probably weekend! Thanks for sharing this amazing recipe!! Cant wait to make this for all of our friends!! Wow this dish is spicy! did I do something wrong? Do you think that if I omit the onions and maybe do 1/4 of the garlic (i'm allergic to onion and sensitive to garlic) I will still get the same tasting dish? I'm not sure how big of a role the onions and garlic play in this dish! Is that 3 x 425g chickpeas plus 2 x 410g tomatoes? Yup, it makes for a big batch of tikka masala, enough to feed a crowd! Just made this recipe for my vegan family, it turned out great and everyone loved it. Except I had to add a lot more cornstarch to thicken up the sauce, I think it's due to the fact that I didn't use full fat coconut milk by accident. Two questions: do you drain the tomatoes before adding them? And, how many ounces of coconut milk do you need as coconut milk comes in different sized cans. Thank you! Don't drain the tomatoes and use a 13.5oz can of coconut milk. Wow! This was amazing!!! I've had to have a lifestyle change due to high cholesterol so from never trying vegetarian meals to now having too- that was so good! Didn't change a thing! That's awesome Phillipa. This recipe is proof that healthy food can taste delicious! Made this for supper tonight. Yum! This recipe is a keeper! Thank you S for stopping by and letting me know. I have NEVER written a review for a recipe before, but I HAD to come back and write about this one. I don't write reviews because I can hardly cook, so most of what I make does't turn out very well... But this recipe was amazing!!!! I have to quote my husband on this one (Please note that he legitimately licked his plate) " Can you please make this again before the leftovers run out?" I haven't gone through all the comments to see if you already answered this -- is there a place online that you'd recommend for spices? There are plenty of speciality stores where I live but still there always seems to be some spice I can't find. So good. Thank you for this amazing recipe. Merci! Filing this under Pinterest Win. 5 stars all the way buddy. Thanks so much! Love this recipe! I also add diced potatoes and peas! I am gluten, soy and dairy free, so this is perfect.. thanks so much! I followed this recipe to the T, and the sauce did not look anything like your picture. It looked chunky with the pieces of diced tomatoes, watery even though I added corn starch and cooked longer than advised in the recipe. The sauce did not stick to the chickpeas, and did not have a texture like any tikka masala I've ever eaten. The sauce had a nice flavor, but I was super disappointed by the texture. What went wrong, and how can I fix this? I think the problem was with the diced tomatoes you used. Some brands are super watery and that waters down the gravy. Next time try using tomato sauce instead! My friend made this for lunch the other day and it was amazing!! I am making for my husband and I for dinner this week. Does a sering = 1 cup? Thanks! No, it's more than that. It's a like a full dinner plate. Makes sense? My friend and I just made this. It was delicious. We added tomato sauce and lemon juice. I STRONGLY recommend you add those two. I have done something wrong, but I am not sure what. When I added the canned coconut milk it became a huge watery dish and the gravy mixture didn't even seem to register. I ended up having to cook it for 20 min to reduce it down. Do you know where I may have erred? It smells so good! Thank you! Will this freeze well? I'm thinking of making this tonight but will want to freeze the rest since it's just me. Thanks! Really yummy recipe! Mine needed a little more corn starch and could have used something to deepen the flavor. Will definitely make again! Though I often cook without meat or dairy, I am not vegan. The recipe sounds delicious, though I'm always hesitant to use full fat coconut milk, since it packs so much fat. I was wondering, as a non-vegan, could I sub nonfat plain greek yogurt for coconut milk? If so, in what proportions and would you recommend any further tweeks to accommodate the sub? Thanks! Lovely recipe! I made this tonight for some meat-eater friends and they thoroughly enjoyed it! Could I make this in the crock pot like your regular chicken masala recipe? Did you every try it in the crockpot, Amalia? I'm also wondering if it would work or if the chickpeas would get mushy. Has anyone used ginger paste instead of fresh ginger? Excellent recipe. I am so making this again! My family loved it! I have made this several times and it is delish! We have been switching to a vegan diet and this is just one of those recipes that I can use again and again. My husband's only comment is that 'This is a restaurant quality dish'. This has become one of our staples on a cool fall day. Hi, I am on strict diet and I see where is has the calories but not what the actual serving size is. Can you please tell me? Thank you. Thank you for this deliciously simple recipe. Can you recommend an alternative for the coconut milk? I have a LOT of food allergies, including coconut, almonds and bovine dairy products... I miss curries so much, but so many of them have cream or coconut in them. Cashew cream using raw cashews. You can google Tal Ronnen's recipe. I am new to your blog, and this is the first recipe I tried. This recipe is a winner when both my 3 1/2 and 1 1/2 year old daughters LOVE it! In fact, the 1 1/2 year old is on her second bowl now! Thank you! I will be trying more of your recipes! Thank you so much for sharing! Happy Mommy here! Ha ha I read that as 12 inches of ginger and I thought whoa that's a lot of ginger...good thing I read the comments. I make a curry with sweet potatoes and chickpeas that I love - it's a lot like this recipe. I really like tikka masala so I will definitely try this! Do you make your own garam masala or do you have one you like to buy? My husband's first reaction to seeing this dish in the pan was disappointment, he thought it wasn't going to hit the spot without chicken. In the end he declared delicious and went back for seconds. Thanks for sharing! Have you ever added additional veggies in addition to the chickpeas. Would love to try it, but don't know if I need more sauce for adding the veggies. Thank you! I think adding some peas, chopped green beans or cauliflower would be delicious! Made this recipe for the first time tonight. I cooked the gravy extra long to reduce it a little and made basmati rice to accompany. My wife is a very selective eater and she went back for seconds. Spice was just right and the coconut milk was a really nice touch. I used arrowroot powder instead of corn starch. Thank you. I have made this twice - it is delicious. Not being fully vegan I think it would also be great with chicken so I'm giving it a go. The curry sauce is beautiful. If using dry chickpeas, how much do you need to make this. 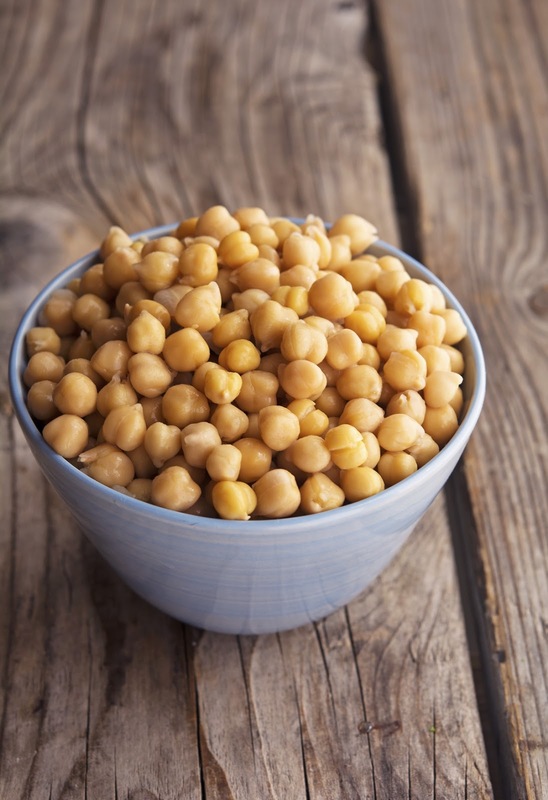 One pound dry chickpeas is roughly equivalent to 3 cans of chickpeas. I was looking for things to do with chickpeas on Pinterest and found your recipe. It is delicious! I made this and LOVED it. Very flavorful and delicious. Thank you for the recipe, it's a keeper. how much coconut milk am i using? also if i decide to use heavy cream how much of that do i use? Super good and easy to make. Made this one yesterday and I just fall in love with this one!!! Thank you so much for this recipe. So delicious!!! That's awesome Lucia, I'm so glad you enjoyed it that much! This was so yummy!!! I'd love to share a link to this page and your recipe on my blog if it's ok with you! Can Nutritional yeast be used to give it the thick an creamy texture instead of arrowroot or yeast? Can I sub nutritional yeast for the arrowroot or yeast? Ths was so very good. A definite keeper! Thank you for the amazing recipe! has anyone made this in a slow cooker?? Has anyone tried making this in a slow cooker? I'm making this in the slow cooker right now and don't see any reason why it won't work. I plan on adding the chick peas towards the end - maybe an hour or so before eating? - so they don't get mushy. Otherwise, added everything else (save the cornstarch for thickening). Yup, really good and worked well! I dumped most of the ingredients in around lunchtime, then put the chickpeas in about two hours before we ate. Also added chopped kale at the end. Hi all. So my family and I are on our 3rd day of Vegan life. So happy but of course i'm getting comments like drink extra supplements and iron bc vegan diet is harmful and lacks vitamins. Help this beginner lol. What should i be taking if at all extra supplements. We've had this twice already! Love it! I did add some Tandoori Masala to give it a little kick! 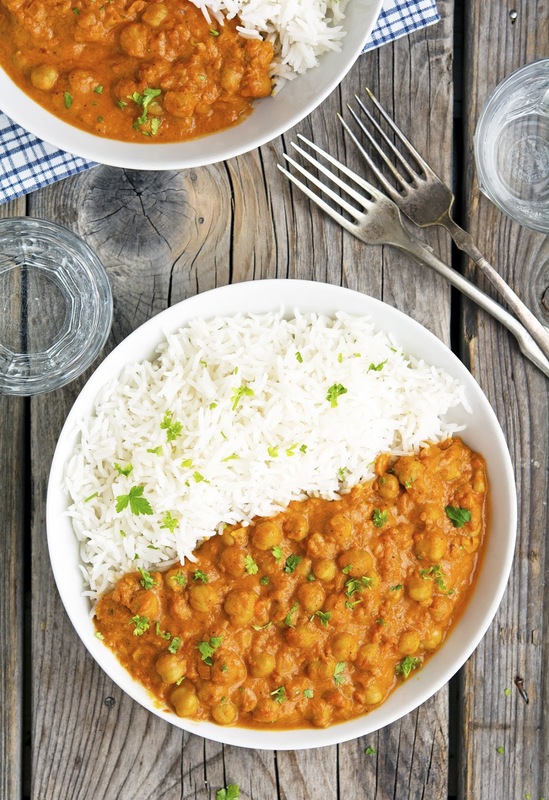 My husband isn't a big fan of either chickpeas or coconut milk - and he loved this recipe. :D Definitely a keeper! This is one of my favorite dishes. I make it a couple of times a month. My 9 year old is the pickiest eater ever. She'll only eat like five things and even she loves it. Thanks for sharing! This was great! The only thing i did not like was the coconut flavor. I love coconut but it made the masala taste sweet. Added some extra salt and pepper but it didn't cover up the coconut flavor. Not sure what to do to fix it. Might just do half a can of coconut milk next time. I really wanted to like this, but the acidity of the tomatoes was overbearing. I think the flavor could have been enhanced by adding some tomato paste, or perhaps a touch of palm sugar to balance the acidity and allow the flavor of the spices to shine through. Perhaps it'll be better tomorrow once the flavors have had a chance to marry. Hey, is there a way to make this in the Instapot? I know I can do all the sauteing in the pot beforehand, but should I dump everything in at once? Or should I hold off on adding the coconut milk and arrowroot until it's done? How long should I set it for? I had a dish in Vegas that combined chicken and chickpeas for the masala. I figure it should be pretty simple to add chicken to this, but I wanted to ask for your suggestion on cooking the chicken - could it just go in the pan with everything else? I ate a chickpea and chicken masala in vegas that was amazing. What's your suggestion for adding chicken to this? Could I cook it right in the same pan? First time I tried this recipe. I added too much tomatoes. Second time around I got it ��! The taste was sensational. It's the best curry dish I've ever made. Totally scrumptious��!